Being a dad is not always easy, but it is one of the highest privileges that a man can have. 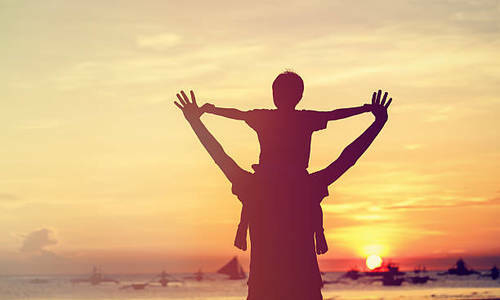 In fact, the title that dad has, father, means the founder or progenitor of a race or a people, and his title, father, comes from the biblical God who is called Father, and the Creator of us all. This means that the earthly father actually has the opportunity to represent God the Father to his children, which is quite a thought to say the least. Of course, such thinking is far removed from the popular ideas that condition us to think otherwise in our society today. With absolutes obsolete in our culture today, we are given the impression that a family can be anything you want it to be. The traditional family, what’s that? Certainly it is not necessary for a society to have stability. (1) A single parent home, where the mother was the head of the home, 30% of the children became involved in drugs, alcohol, crime and violence. (2) In the two parent where there wasn’t a good relationship with the father, 68% of the children were likely to get involved in alcohol, drugs, crime and violence. (3) In a two parent family with an excellent relationship with the father, .06% of the children became involved in drugs, alcohol, crime and violence. Yes, both fathers and mothers are needed in the family. O.R. Johnson in his book, “Who Needs The Family?” points out the necessity of the mother to bring love, nurture, support, and direction. Then he points out, quoting from Eickhoff, that father poverty undermines the security of the child and its ability to face the unknown or great excitement with that optimistic confidence of a safe landing natural to the well fathered child. Certainly, dad and mom need to work together to make the family what God intended it. In the month of June when dads are honored, I want you to know how much you are appreciated, but also how much you are needed in your family. Obviously you have many things to do, but your family should be your top priority. Your person and time is what your wife and children need. Play with your children. Praise your children. Listen to your children. Pray for your children. Provide loving leadership for your children. Above all, provide them a spiritual basis upon which to build their lives. Jesus Christ is that foundation. I trust that you know Him personally and are seeking to lead your family in the paths of righteousness. Read John 3:16 and Ephesians 6:4 in the Bible.